Convoy this morning said that it has achieved 100 percent automated matching of loads in its top markets across the country, resulting in no human intervention in the process. The company said that nationally, 95 percent of all loads on its platform are now being matched automatically. Routes now seeing 100 percent automated matching include major West Coast markets such as Seattle, Portland and Los Angeles; Midwest routes from Chicago, Cincinnati and Milwaukee; routes from Texas markets such as Dallas, Houston and San Antonio; Northeast routes from New York and Philadelphia; and Southeast routes from Atlanta and others. Convoy’s platform allows shippers to post loads and drivers or carriers to accept the loads they are most interested in hauling. Using technology to improve this process, Convoy said it has allowed carriers to quickly and easily find and book their desired loads. The company said it measures booking loads with carriers in two ways – by finding a truck that is available and can arrive on time (matching), and by the carrier and shipper agreeing on the rate at which that work will happen (pricing). Convoy pointed out that the cost of labor accounts for 65 percent of a typical broker’s expenses, according to DAT data, with a single broker representative making 100 calls to book just 10 loads. 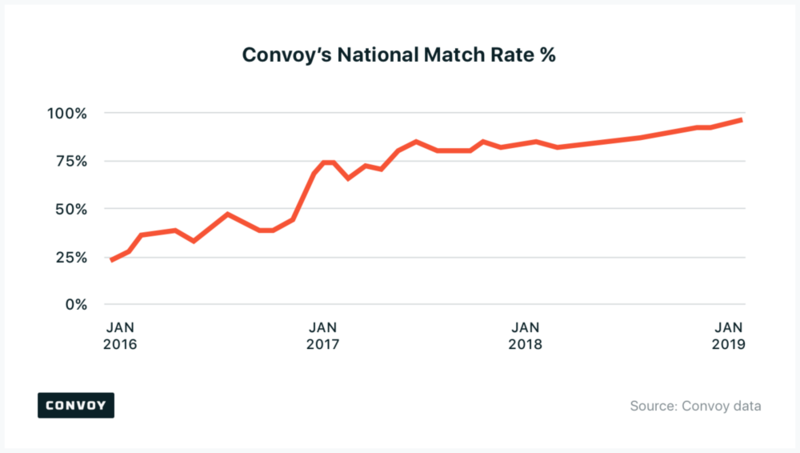 By developing a National Match Rate metric, Convoy believes it can reduce costs for shippers, improve earnings for carriers and continue to invest in new innovations. The company attributes this milestone to new features within its app such as No Hassle Detention, Flex Loads and Instant Bidding that have led to an increase in adoption. Ismail said that it is not only these features, though, that have driven app adoption. An example of how data has helped improve the product is the company’s Request a Load feature, which allows carriers to directly share preferences and get them the loads they want with less effort. A benefit of automated matching is a reduction in cost, something that Ismail said benefits both sides of the transaction. Achieving 100 percent matching did not happen overnight. Ismail said when the Convoy platform first launched, only about 25 percent of loads were automatically matched. “We got to about 80 percent a year and half ago and then really had to rethink some of our core ideas around matching,” he said. “This is where the team spent a lot of time experimenting with different ideas and talking to drivers. This ultimately led to a new set of innovations that has brought us up to 100 percent. Datapace is the latest company to join the Blockchain in Transport Alliance (BiTA). Learn more about Datapace and BiTA in this article. Nikola Motor Company formally introduced its hydrogen-electric tractors, the Nikola Two and Nikola Tre (for Europe) at Nikola World 2019. Here are some photos from the event. The U.S. is proposing $11 billion in tariffs on European Union goods because of allegations that Airbus received that amount of subsidies when it launched the Airbus 380, thereby harming U.S. interests. Read Jesse Cohen’s explanation of the articles proposed for tariffs and what the tariffs might do to the air cargo and maritime industries. Heartland Express, Inc. (NASDAQ: HTLD) announced a first quarter 2019 profit of $0.21 per share, which was $0.02 ahead of analysts’ estimates.